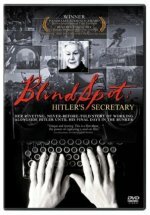 Blind Spot: Hitler's Secretary release date was Friday, January 24, 2003. This documentary presents 90 minutes of interview footage (edited down from more than ten hours) with Traudl Junge (1920-2002), who from 1942 to 1945 was one of three personal secretaries of Adolf Hitler, whom she describes as a "pleasant boss and fatherly friend". Ms. Junge describes first-hand experiences of what life was like within the most inner circles of the Third Reich, including those chilling last days for Hitler, Goebbels and Eva Braun in the bunker, where she transcribed Hitler's last will and testament before he and the others committed suicide.